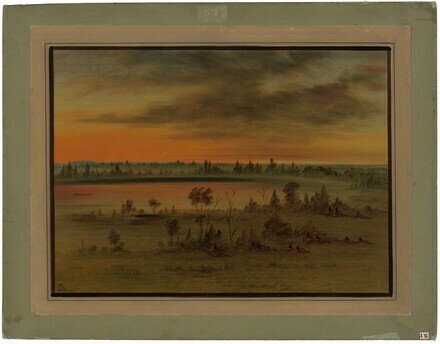 A SIOUX WAR PARTY reconnoitering an Ojibbeway village, at sunset. Calhoun, upper Mississippi. 1832. Indiens des deux Ameriques, Salle du Jardin Botanique, Brussels, 1870, no. 527. Catlin's Indian Cartoons, Somerville Gallery, New York, 1871, no. 391. Extended loan for use by Ambassador Julian Martin Niemczyk, U.S. Embassy residence, Prague, Czechoslovakia, 1987-1989. Extended loan for use by Ambassador Shirley Temple Black, U.S. Embassy residence, Prague, Czechoslovakia, 1990-1992. American Paintings: An Illustrated Catalogue. National Gallery of Art, Washington, 1980: 105, repro. American Paintings: An Illustrated Catalogue. National Gallery of Art, Washington, 1992: 91, repro.